Welcome to Off the Pitch with Active. 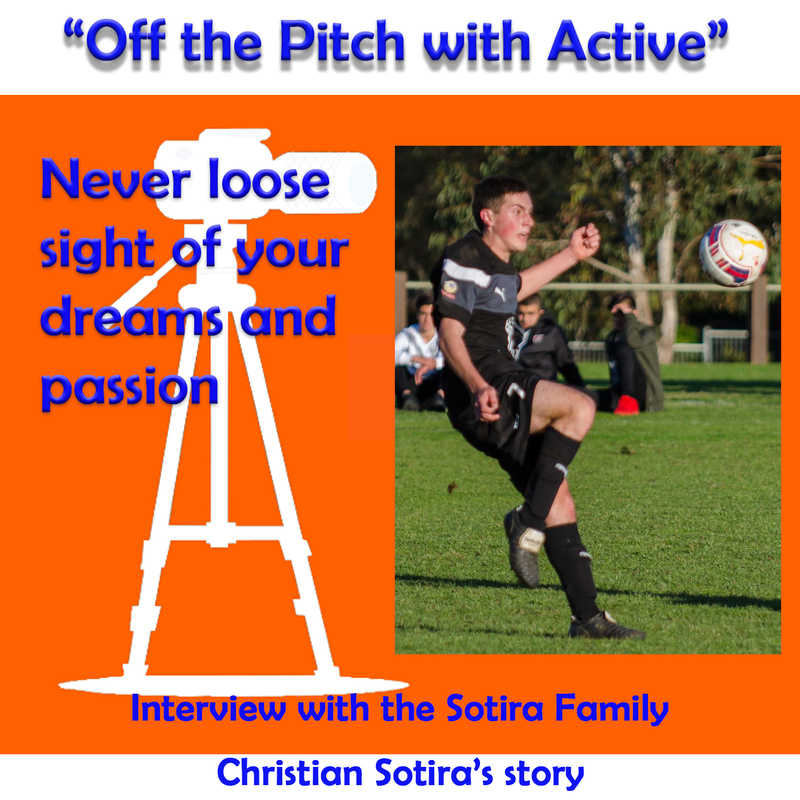 “Off the Pitch with Active” is a program of interviews with people involved in junior sport for the benefits of children’s development. I am hoping that these interviews will help recognise people who donate a massive amount of time to the community and the opportunities they create for kids. I also like parents to get a better understanding of who these people are and why they are spending a lot of time for the benefit of their children. AI: I am really excited to introduce my very first guests to my program. 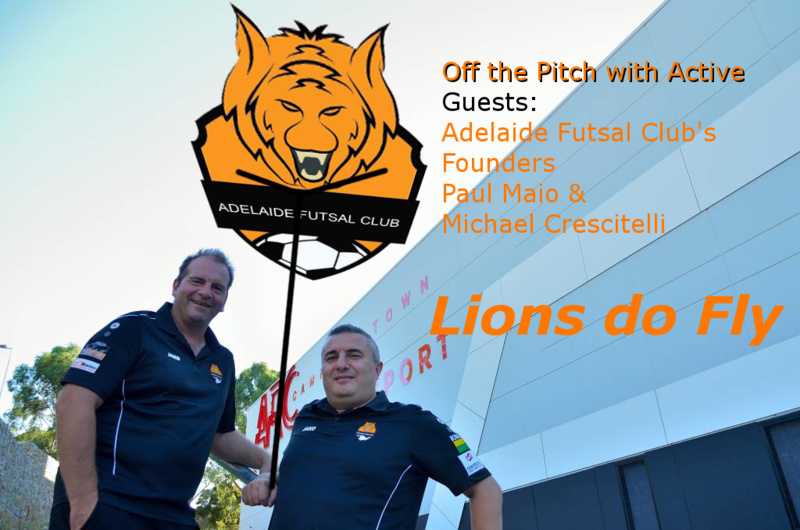 Paul Maio & Michael Crescitelli founders of Adelaide Futsal Club “Lions” It’s “kinda” feel right to have both of you to kick off this program because of Lions very successful first year. AI: First I like to compliment you on your achievement last year. 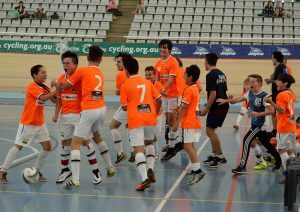 It’s amazing that from a club that was nothing a year ago to have two teams in the final at Futsal Oz Junior Nationals last month. AI: Before we get into questions, I like to go through some stats about your first year. AI: Amazing achievements for any club even if the club has been around for a few years but this is your first year. When did this all start? PM: Michael really started the idea. MC: Basically, we always played Futsal on a social night and Jan 2016 I took an U10 team from the local social league to Melbourne Futsal Oz Junior Nationals and surprisingly they made semi-finals. Given that we never trained and just took futsal for social fun for the kids but still reach that far. We came back to Adelaide and I start talking to Paul. I told him “the gap wasn’t that far” considering the teams we played against are full time futsal clubs. Maybe, we could create a similar model, when the outdoor finishes we start indoor and train once a week. Maybe we can close that gap. That’s how it all came about. AI: You certainly made your mark over there. MC: Yes, so we decided to put some ideas together, speak to a few sponsors and BANG! Within a month we had a club going. AI: Wow! so who picked the colour and why orange? MC: it is called neon orange. PM: We thought it definitely stand out. When it arrived we had a pre-season tournament at the Velodrome and the neon orange definitely made an impact. Everyone was talking about the colours and the kit. MC: Yes, it was probably the right choice, Orange lions theme it stood out. Like the CEO of Futsal Oz said, we definitely lit up the arena at Futsal Oz. AI: So what is the core philosophy behind developing kids? PM: No1 Its developing a fun aspect to the game. They have to come here and enjoy the game. A lot of time (we do outdoor coaching as well) it become very structured and robotic with the actions. You want the kids to come here in the off season and enjoy a smaller version of the game. Do it at a time when they can have fun and be free and still have some basic concept because it is a different game to the outdoor game. Just let them get the general knowledge of ways we want to play the game. There are a lot of different formations you can do with futsal and we stick to the diamond shape and different variation of this depending on age groups. That is ultimately what we want to have fun in a learning environment with some structure but allowing them to be free to express themselves. MC: Like Paul said fun as well as learning if you can combine it together you got the right combination with good people that has been the big keys. All the kids that have joined from young to youth and their families it just been a great bunch of people who have embraced the culture. It has become one club for all. PM: We want to create a good culture. AI: You must have very understanding wife’s who shares your passion. Dare I ask how many hours you spend every week on the Lions? PM: [Laughing]… well..[hmm]… it is definitely an “ebbs & troughs” kind of scenario. We have both separate tasks we wanted to achieve but we do a lot together. We are very fortunate to have flexible positions at work that enable us to do it. Definitely, having our families involved, both our children’s play, makes a big difference. Ultimately what you find in family life is that you are going to sport, sport is part of that culture in Australia. So you going anyway and we just coach other children’s as well. Naturally, we want to create a family culture. As the whole family is involved, it takes away that separation and that is the key to it. AI: Michael, how is Franco feeling about his dad being involved? MC: He enjoys it. I got a very close father and son relationship with him. Wherever I go to games and trainings he tags along. The last few weeks he has come along and watched a few senior men’s games. I think the fact that his father is a co-founder, makes him feel part of it too. He has embraced that culture as well. AI: And Olivia will start at what age (3 years old now) [laughing]? MC: Well, we may start some grass root program later. AI: What about you Paul, you got Matthew, Isabella and Peter. Different age groups and a girl? PM: I really do like the female participation hence why I chose to coach the girls. This is something we want to build on as a club. As for having the children involved they are just lovers of the game and loves football (soccer). The beauty of it, it’s a group of Mates that got together. It was a new team new people around them and they just enjoy every moment of it. That’s what is all about. It is about bringing new people into it. It’s not about one specific area or one specific town whoever wants to be involved in AFC we want as many people we can get. AI: And Peter has become a referee, he pretty much lived at the Arc and at the Velodrome every weekend. PM: Absolutely, It’s another great way to get some added income for these children who are studying. Instead of doing the long hours they can play the game and referee as well. AI: What has been the biggest challenge in terms of getting AFC Lions started? PM: For me it’s been getting people buying into why futsal, I mean we are definitely one of the first Adelaide club as far as futsal goes. Before then it was very social with many social aspects to it and people didn’t understand that we are going to run it as a club. You pay your fees, you get you training sessions, games and kits included. It’s a structured way it’s not only getting your mates around and have a kick-around. We want to make it to a level when it becomes a club competition down the track. Understanding the fundamentals to have a futsal club. MC: Yea, one of the things I said to Paul in the beginning “What I want the club to achieve is that you want to make sure it is recognised and it is branded” and I think that has just been falling into place. With all the success on and off the court it has given us great exposure. This is a credit to everyone involved, players, parent’s post’s on social media spreading the word out. I think it is all coming to place its been “second to none”. AI: Another aspect to a community type of club is sponsorship. It is a critical part for sporting clubs and you have some great sponsors, such as Newtons Building and landscapes, Davison Earthmovers, Jako Living sport, Pro Customs, Boral, Cafe Va Bene, Eastern Building Group. How challenging is it A) to gain new sponsorship and B) keep them? MC: Look, I think once you got them on-board retaining them is when they become part of the club. That once again comes back to be one-for-all-club having the right people players, parents, coaches, sponsors. Every sponsor who has been involved in our first year has pretty much said they will come back on-board. They have enjoyed the exposure we have created for them and they have enjoyed the success we have had off and on the court. And what a lot of sponsors have said. 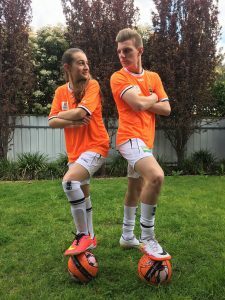 On our website http://www.adelaidefutsalclub.com.au we have set up a testimonial page which couple of our sponsors put some feedback on there and one thing they admire is the amount of time that has been put into junior development. Being locally owned SA businesses they like to interact with local junior sports development. AI: How do you divide the work between you. It is obviously an enormous amount of work needed to be done in the background. Is it one with an admin type brain or is it two creative guys getting the job done? MC: two creative guys (laughter). We communicate every day whether it is by phone, coffee or lunches. We are basically open for to talk anytime. PM: Yeah and we are not big headed either. I mean we are very open to elaborate different type of things sometimes it is “off the cuff type of stuff”. We are very bold in our decisions sometimes Michael makes some and sometimes I do. That is the key to it all. At the end of the day it is not about Michael and I it’s about the children’s enjoyment and about parents dedicating their time as well. But it’s not about US we ultimately try to do the best for the children. MC: True and if we keep that frame of mind it should be fine. AI: Of course, you manage to attract a lot of great coaches too. I have seen how they interact with the kids when I have been taken photos both at the Velodrome and here at the Arc. They have a great rapport with the kids and they make it fun with a bit of structure too. MC: Every parents from every team have said nothing but praise for their child’s coach. AI: Did you hand pick the coaches? PM: Yes, but also saw some people who wanted to buy into this but it was also challenging to get coaches to buy into this. The club just evolve because of the coaches and parents and really it started because of the sponsors and that is the make-up of the club. Yes, we do a lot of work but ultimately it means nothing if those pieces to the puzzle don’t come together. AI: So what is the next big goal for 2017? PM: well we probably in the most prestigious place (The Arc) to play the game in Adelaide. We are definitely looking at doing academies during the year. We embrace futsal and try to get it to that full time all year scenario. We hopefully can look at schools. I want to get into schools as well and make it part of their curriculum. Stay tuned for some holiday tournaments here at the Arc. And more importantly getting more player participation in the game and that is ultimately what we are after. It does not necessary means all with AFC but more learning the game. That is what we foresee; building on the momentum and take it on another level. AI: so going back a few years (perhaps many) when did soccer start for you Michael? MC: I had a few stints at soccer when I was a junior but I had chronic knee problems about 3-4 years in a row. I start playing around the age of 8 then I stopped for some time so I basically missed the junior development and went straight into senior amateur league when I was 16 years old. Then after that futsal. MC: I started to play futsal in the late 90’s right through to ’03. I was actually playing futsal 3-4 times a week. Then I got out of sports all together. I had a back operation in 2008 which was great and instant success. Having had this time away I wanted to get back involved and thought coaching would be the best way. A: What about you Paul? PM: Outdoor, I was always a Campbelltown City boy but futsal I started to play in year12. We used to have a Melbourne based school come to our school and vice versa we go to that school in Melbourne. That is what made me fall in love with the game. We had a packed stadium at the school, Campbelltown High, we were down 4-1 at half time and we managed to win that game 7-4. If you could picture that everyone could not get into the gymnasium at the time. It was people everywhere and we felt like heroes that day. And never have the outdoor game given me that sense of, and I have won cup finals with outdoors, but never felt that love and passion I felt that day. I just fell in love with the game. I think I played Michael in those old days. AI: Who was winning the games? PM: Let’s just say we never lost very often [more laughter’s]. I have pretty much played in all stadiums we have today around this area. Back in those days it was more indoor soccer rather than futsal. It was a lot of rebound. So basically, when futsal started, I was playing. AI: Obviously in those day coaching was very different if any. Perhaps not particular structured. How have you seen coaching developed over the past 5 to 10 years and where are the biggest changes? PM: I just see the analysis of the game is just getting bigger and on better levels. Because it is a smaller area it is easy to use your video and technology we didn’t have back in our day. Now you just pull out a mobile phone or iPad and you can actually video the whole game. 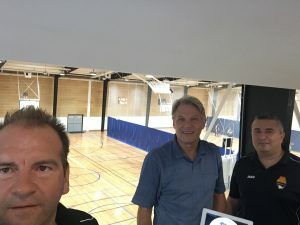 What really thought me where it is at was at the same time Michael brought a team to Melbourne Futsal OZ National, I went to the nationals in Sydney where every game was recorded on video and analysed that evening. That really gave me a feel about the competition and I just see it becomes more and more structured and analysed. AI: What is your thought Michael? MC: I think Futsal is like Paul said given the fact that the game is a lot shorter. You get more time to analyse from a theory point of view. It does not take a lot of time out of a training session to analyse a game. I think this is a big part of coaching. AI: So what advice can you give to parents with kids involved with futsal. MC: I am a big believer, and there are a lot of documents supporting this, that key of player development is touches on the ball. The more touches the more you develop. In a 30 min game of futsal a player will touch the ball, probably 250% more than in a 60 min outdoor game. I explain this to parents to get their kids involve because it is so beneficial for them. The quick thinking involved and the speed and pressure of the game is really benefitting to their outdoor game. AI: What about you Paul? PM: For me futsal is moments, moments for players and moments for parents. We have seen so many moments this year. You can’t name all of them but played interstate, penalty shootout. We have had young children play a year up from their age group having some unbelievable results even on a national scale. I am talking about little 7 year olds. Talking in broad terms, we were able to bringing the two sides of Adelaide together and create some moments that these parents will never forget. We as parents, we see our lives through the eyes of our children and what we love is to see joy in our children. I don’t think it is many parents that does not see joyous moments with their child’s faces (playing futsal). AI: I agree and that is exactly what I love when I photograph kids in action, in THEIR moments and to be able to share this with the parents is just brilliant. MC: Ken if you recall the last moment in the semi-final at the Velodrome, and we replicated this moment in Melbourne Nationals in the semis too, right on the siren we scored a goal to go into extra time and then win the game to get into the grand-final. Everyone keeps talking about it not just parents from the U14’s team. And the U7 get into penalty shootout and the U11 get into U12 grand-final. There were also some big moments in U15 playing U16’s comp 6-1 down 70 seconds to go and scored 4 goals in 70 sec. If the game was going for another 30 seconds, they may have won. It’s the moment that makes the parents and players really imbedded in the culture of the club. AI: If you picked one excellent moment this year what would that be? PM: there are so many but for me it was an AFL keeper coming to the nationals as a goal keeper and he never played as a keeper before. In the game Michael referred you to (6-1 down) he took upon himself to get the ball into play and score a goal from inside our own half. He pretty much shocked the whole stadium. 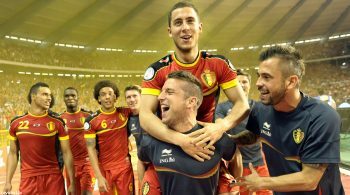 It wasn’t about winning or losing moment, it was just to see that joy in his face. He may never play futsal again but he gave himself a moment to tell his Mates in 20 years-time that’s how easy futsal is “even I can score a goal”. That for me is one of many favourite moments. AI: What about you Michael? MC: I got two favourite moments because these are both identical the U14 semi-finals 4-1 down 3 min to go. Got to 4-4 with 10 seconds to go and score the winner on the final siren to qualify for the grand-final. Similar moment in semi-final at the Velodrome. 3-2 down and Michael Cittadini scored right on the whistle which got us to the extra time and from there the boys absolutely destroyed the opposition and then moved on winning the grand-final. AI: Those are excellent moments. Choosing from people from all over the world, passed & present, young and old, who has inspired you? PM: There is a boy called Falcoa, he is probably regarded as the best futsal player in the world. If you watch him play and see the things he does on a futsal court you be amazed. He does things that you are not supposed to do. He just does it to show off and to me futsal is about showing your skill off. Playing futsal gives you a time to be arrogant and show off and Falcoa does it best. It’s great for young kids to see this. It’s on Facebook, social media and everyone will enjoy to see what he does and how he takes the “Mickie” out of other players. MC: My inspiration for the game comes from an outdoor player. I am a die-hard Liverpool supporter and I get inspired by Steven Gerard. He was the classic example of a player taken the ownership showing the passion and love for the club he is involved with and a one club person man. AI: changing pace a bit, you speak about family and culture what are some of the great family moments? PM: and I took a photo. I never saw two prouder children already embracing the club and from that moment onwards whether it will be Michael’s relative’s, nephew, cousins whatever it might be everyone has embraced AFC. We sort of know that is when you have the momentum. That’s when things are really getting into high gear. That was a very special moment for me. AI: Send me that photo so I can share. AI: Michael what is your greatest family moment. MC: Family moment is probably having my family both at the National in Melbourne for both U11 & U14. Having Joyce (wife) and Olivia (daughter) on the side line at the semi-final and supporting, running on the ground when we qualified for the grand-final. Also having my son (Franco) in the team U11 qualifying for U12 grand-final. That is special. AI: As we all know, behind every successful man there is a very special woman who is supportive, understanding and very hard working running a house hold, making sure dinner is on the table, washing the futsal kits and perhaps got a job or a business. What is the most romantic thing you have done for your wife’s? PM: Ah…….this year [hm]… what I did… I brought home a Lions cap for Lucy to wear. PM: Having all three children involved Lucy now enjoys futsal. She has embraced the whole futsal culture and they were a big part of the presentation night. They (Lucy & Joyce) are really calming us down, I mean we are not easy people and you do need a person to offload stuff to and they are really great support. 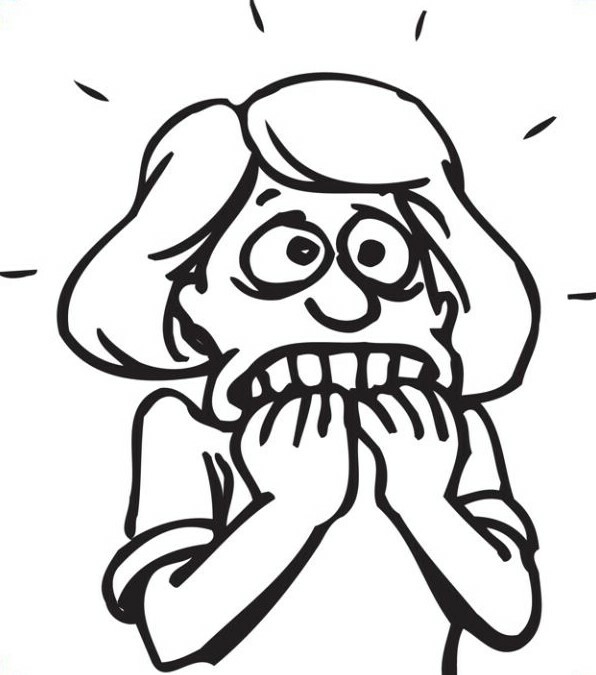 We pretty much have football all year around. It is incredible important to have that support behind us. Ultimately it is all about involvement and they understand who we are. PM: Since ’98 so 19 years in October. MC: Everybody…no really it has been good, challenging but has been good. AI: Do you have plans for Valentine? MC: Ken do you want to know my honest opinion about Valentine? AI: Paul what is your plan? AI: I really appreciate you time, it has been great, we had a lot of fun. PM: before we leave we want to thank Active Illustrated for all your time taking photos and post on social media. MC: Our journey has only been successful because of the people involved and Active Illustrated has definitely been one of them. AI: Thank you, I enjoyed the “buzz” around the club and love to continue being a part of it. Before we leave I have to ask the selfie king to take a final photo. PM: It will be my pleasure. Interviewer: Ken Willner: I would like to thank Paul and Michael for their openness and freely sharing their story. 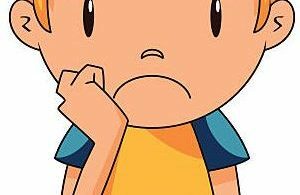 If you like to comment, feel free to do so below.